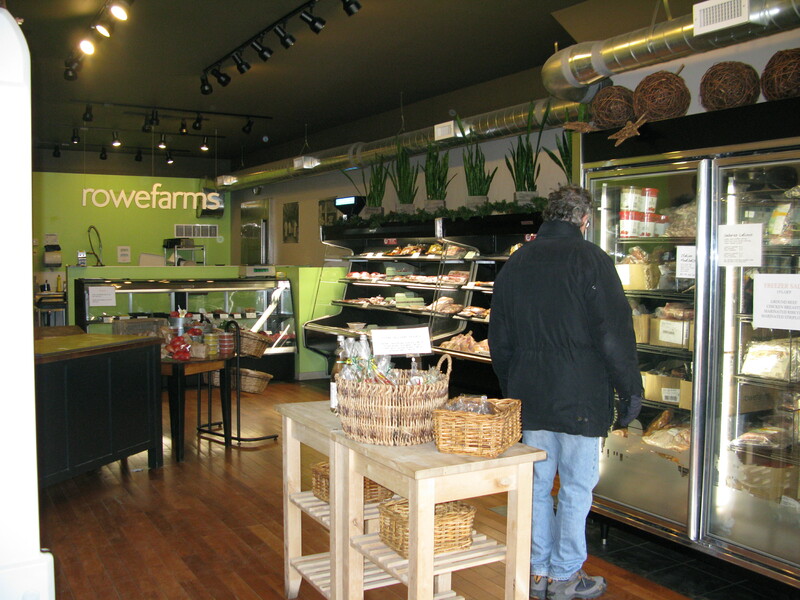 By West Annex News | After waiting almost a month for their hydro hookup, the Rowe Farms retail store at 468 Bloor Street West finally opened its doors in the West Annex today. 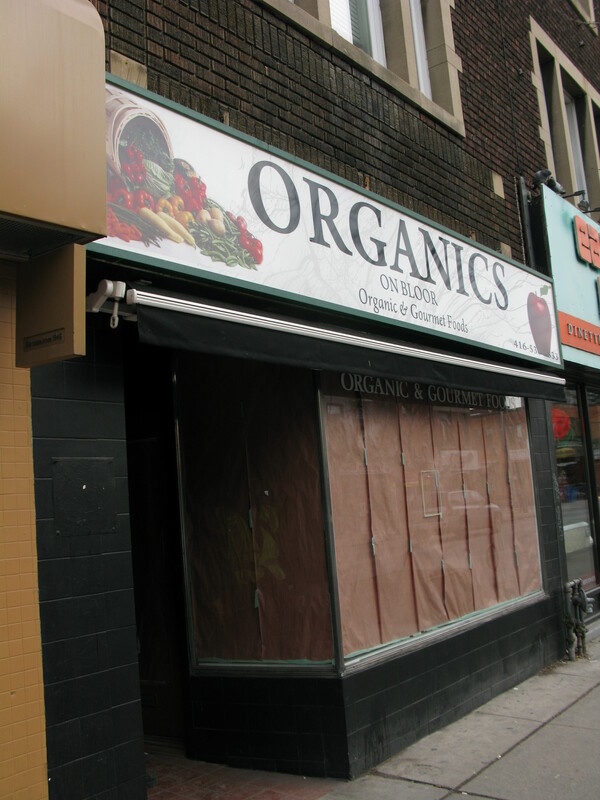 Rowe Farms takes over the space vacated by Organics on Bloor in the first half of 2010. 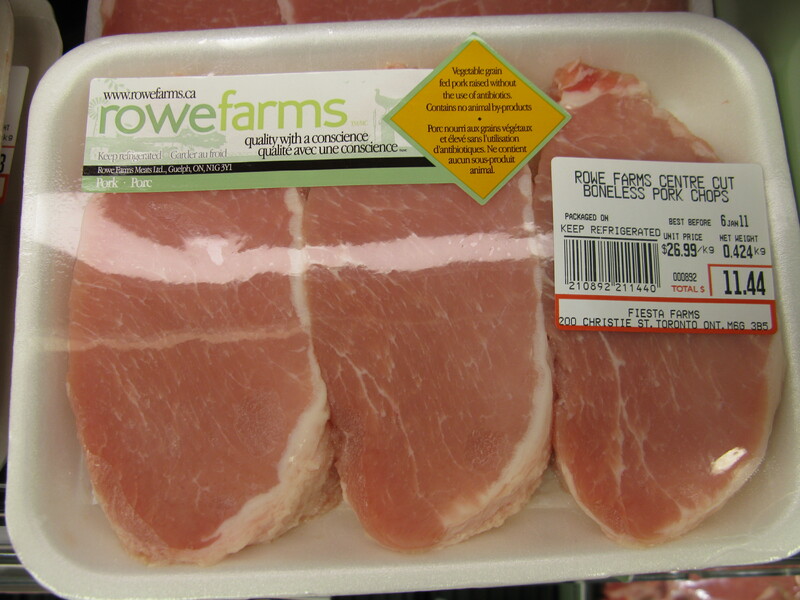 Many in the neighbourhood will be familiar with Rowe Farms meat products from Fiesta Farms and from the Rowe Farms outlet in the north building of St. Lawerence Market. Many do not know however that founder John Rowe sold his operation a few years back. The new ownership is expanding the brand with a string of retail outlets in various family-friendly, upper middle-class neighbourhoods in Toronto, including the Beach, Roncesvalles, Leslieville, and Bloor West Village. While waiting for the opening of the store on the West Annex Bloor strip, we visited the Roncesvalles store, which has a similar floor plan to that of the West Annex shop. 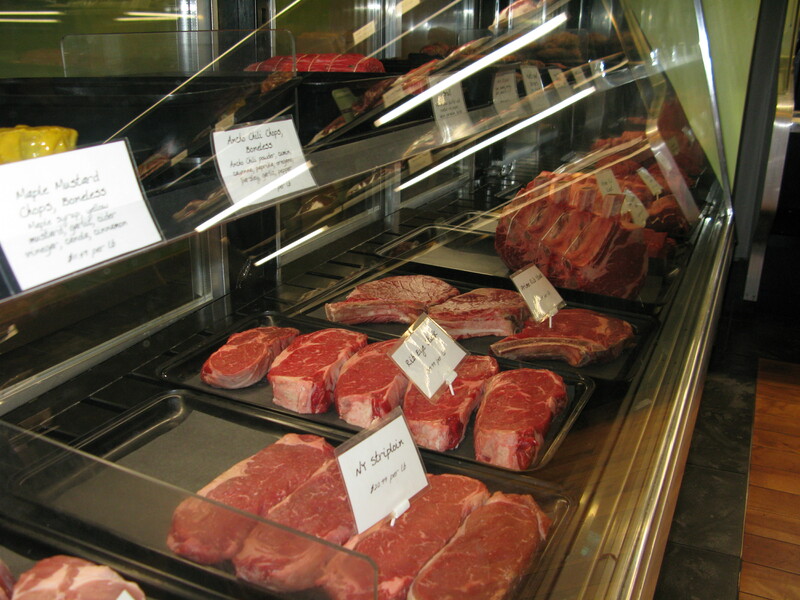 It’s an attractive, well-organized space, offering the full selection of Rowe Farms meat, poultry, and prepared meat products like sausages and meat balls. The outside sign is green, the walls inside are green, and even the shades on the light fixtures are green. Yes, the theme is local and sustainable with an emphasis on animal welfare. 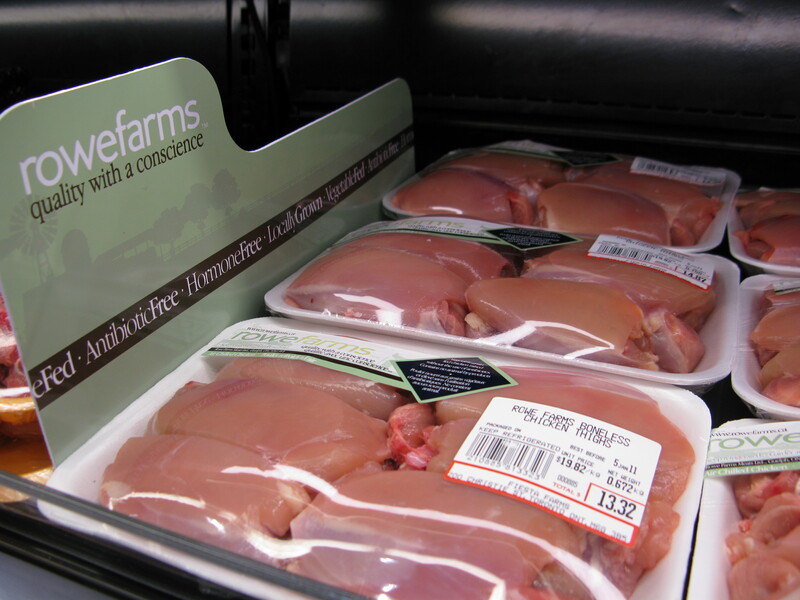 Rowe Farms’ slogan is “Quality with a Conscience” and the website recites a farming philosophy of “locally-grown, antibiotic-free, hormone-free, conscientiously-farmed, nitrite-cured (100% nitrate-free)”. Note: while the meat may be all that, the butcher at the Roncesvalles shop acknowledged to us that Rowe Farms products are not organic. 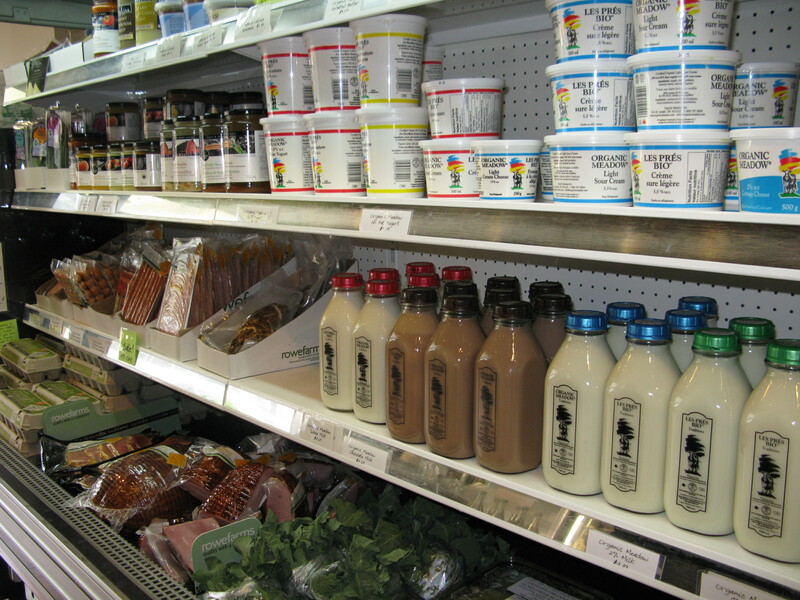 The store also offers a selection of products from other local producers including Organic Meadow dairy products, Anton Kozlick’s Mustards, and eggs, salad greens, and other prepared foods. In addition to offering frozen and refrigerated packaged meat products in the large coolers that line the sides of the shop, there’s a butcher’s counter at the back, staffed by a real live butcher. The West Annex Bloor strip has been without a butcher shop since a rent increase caused the owner of Elizabeth Deli and Meat Market to lock the doors and walked away from her thriving store at 410 Bloor Street West in December of 2005. 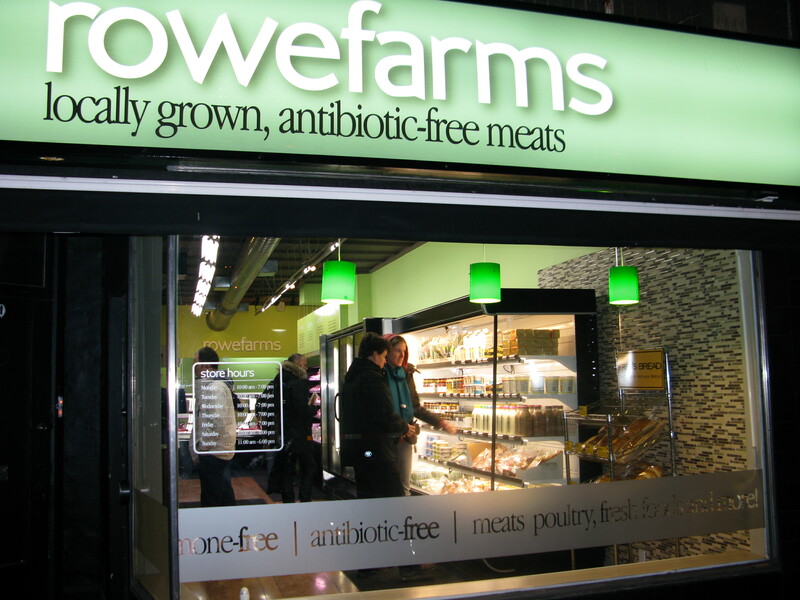 Some will welcome Rowe Farms as the return of a basic neighbourhood amenity to Bloor Street. But is Rowe Farms a basic amenity? Elizabeth’s was a full service butcher and European-style delicatessen. It contained its own smokehouse on the second floor where staff prepared sausages, hams and other meats. Elizabeth’s offered a wide variety of products at an equally wide range of prices. It attracted a socio-economically diverse clientele. Extra lean ground beef: Rowe Farms: $16.99; Fiesta Farms (ground Angus) $15.41; Loblaws President’s Choice Blue Menu (Angus Sirloin) $13.21; No Frills $9.44; Metro: $8.80; Price Chopper $8.45. Torontonians are in the grip of a so-called ethical and healthy meat craze. Nose to tail eating and charcuterie plates reign in Toronto’s trendiest restaurants, and indie butchers are eclipsing indie coffee shops as the hottest trend in retail. Hahn quotes Toronto celebrity butcher Peter Sanagan of Kensington Market’s Sanagan’s Meat Locker in explaining the trend: “In Ontario we are not as lucky as, say, California or Vancouver where they have a more temperate growing zone where vegetables have a longer season. But meat is something we can do well, and it’s all year round.” But Sanagan is honest enough to acknowledge that the movement towards local produce is a “privilege trend” because of the cost. The proliferation of high-end butcher shops–variously described as green, healthy, ethical, organic, local, and conscientious–is more evidence that Toronto is becoming a city of stark socio-economic extremes, the work of The Stop and Food Share in promoting local and healthy foods for low-income Torontonians notwithstanding. And are these meats really all that green and ethical? After energy production, livestock is the second highest contributor to atmosphere-altering gases. Nearly one fifth of all greenhouse gas is generated by livestock production, more than all modes of transportation combined. Note: interior photographs are of the Roncesvalles store. In Arrivals & Departures, we watch the changes in the commercial/retail strips of the West Annex on Bloor, Bathurst, and Dupont Streets, and think about these changes in the context of Jane Jacobs’ analysis that popularity on retail strips can lead to commercial monocultures and store vacancies and Max Fawcett’s thesis that the Annex is un-gentrifying. For related articles, visit the Arrivals & Departures archive.